Ah, the English countryside. Home to genteel activities such as basket weaving, flower arranging and pottery. Little old ladies providing cream teas on a Sunday afternoon. The countryside in the spring conjures up images of lazy afternoons, picnics in meadows and village fairs. 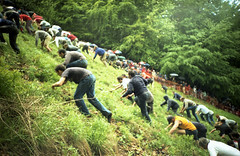 There is a more extreme side to the country, however, that comes in the form of cheese rolling. Now this may not sound dangerous, but the traditional cheese rolling festival in Gloucestershire is not to be tackled by the faint hearted. Nobody knows how long cheese rolling has been going on, as the event was already documented as being an old tradition in the early 1800s. It could have evolved from ancient fertility rites, or as a way for commoners to exercise their rights of access to the land. In the rationing era between 1941 and 1954, a wooden ‘cheese’ was used which had a tiny bit of real cheese in the centre of it, so that the tradition was maintained. Even when the race has been cancelled in recent years, the cheese has still been rolled. Injuries are common and the annual cheese-rolling event is always well attended by the St. John’s Ambulance service. In 2009, there were 18 injured, a number that the ambulance service considered low in comparison to other years. The highest toll so far was in 1997, when at least 33 competitors were injured. Injuries ranged from spinal injuries, to cuts, bruises and sprains. As the competitors tumble down the 1:2 gradient hill in an attempt to catch the 8lb Double Gloucester cheese, the race quickly turns into a veritable bloodbath, with impressive tumbles and falls being the order of the day. Spectators are not safe from the risk of injury either, with one unfortunate chap being hit by the rolling cheese and sent tumbling down the hill into the waiting arms of the ambulance crew.